I’ve recently come to terms with the fact that I am indeed becoming my mother – maybe not in my fashion sense or mannerisms, but most definitely in my stockpile of healthy dinner recipes. Years ago, I discovered a stash of recipes she had that all started with 1 pound of ground beef. It seems that in my pre-internet childhood, every food company or organization, from the Beef Council to Campbell’s Soup, regularly produced small recipe booklets to promote the use of their products. These recipes became the foundation of family meals, potlucks, and recipe boxes for a whole generation; although nutritional information and diets have evolved over the years, I find that many of them are still great staples today. Ironically, the simplest adaptation I’ve done for this hamburger skillet recipe was converting it to a vegan meal while maintaining the same flavor profile. There are certainly a variety of vegan “mock meats” available, but I’m not really a fan of most of them. 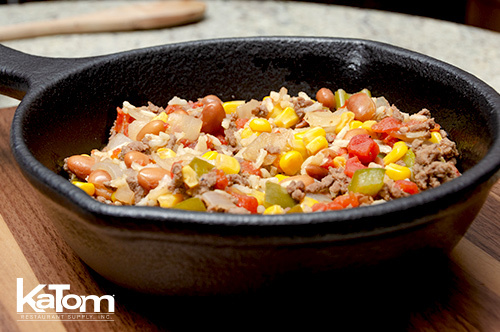 Instead, for this hamburger skillet meal, I added extra beans for protein and swapped out the ground beef for chopped portabella mushrooms. Baby bella mushrooms have a terrific, firm texture similar to tender beef; if you let them cook down slowly in the skillet with lots of onion, they add a rich and savory flavor to the whole dish. No matter which version I make, I always toss in any extra chopped peppers or zucchini I have on hand – after all, in our quest for healthy dinner recipes, the more veggies the better – but at some point in the evolution of this dish, I realized it almost always outgrows my cast iron skillet. It does still fit in my deep-sided electric skillet, but all of my extra ingredients mean it’s almost impossible for me to make a small batch! 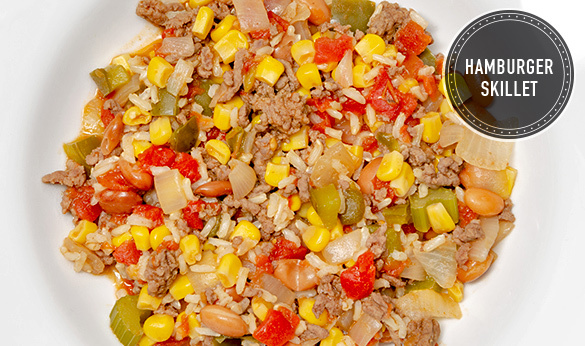 This hamburger skillet recipe will almost always guarantee leftovers later in the week. Depending on my mood or what I have in the fridge, I often add a new flavor like salsa or barbecue sauce to my bowl, but one of my roommates always added ranch dressing to the leftovers and tossed it cold over salad. 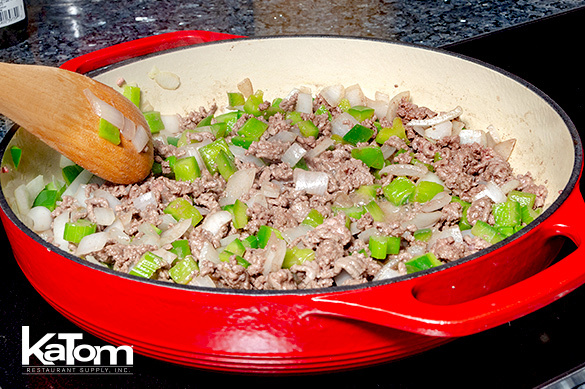 When it comes to the endless search for delicious and healthy meals, my priorities are simplicity and adaptability, and this hamburger skillet obviously fits the bill. It’s one of my most tried-and-true “mom meals” to this day. While this dish is simmering away to cook the rice, I usually make a quick tossed salad to complete my meal. 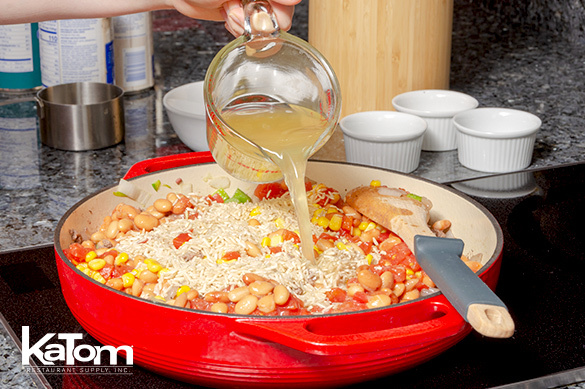 Use a large, deep-sided skillet or electric skillet. Sautee chopped onion, pepper, and celery in small amount of oil for around 3 minutes, or until it begins to soften. Add ground beef. Continue to cook until beef is cooked and onion mixture is soft. Drain off excess fat, if needed. Add remaining ingredients. Simmer on medium-low until rice is tender and all is hot, about 20-25 minutes. 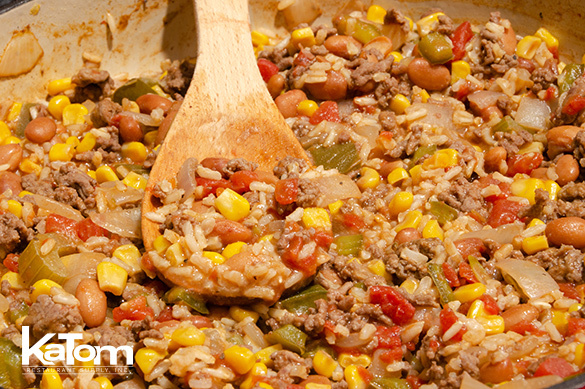 For larger versions of this recipe: After browning the ground beef, combine all ingredients in a large casserole pan. Then cover and bake at 350 until rice is cooked, around 30 minutes.